SHOWMANSHIP OVERVIEW Jennifer Smith, Elysian Fields, Texas, left, claimed first place showmanship honors, winning the prestigious Dean Hurlbut Award, at the 2008 National Junior Angus Showmanship Contest, held in conjunction with the National Junior Angus Show, July 17-19 in Des Moines, Iowa. American Angus Auxiliary President Nancy Thelen presented the silver Revere bowl in honor of Dean Hurlbut. The top five winners also received a monetary award from the Ham James Memorial Fund. Photo by American Angus Association. 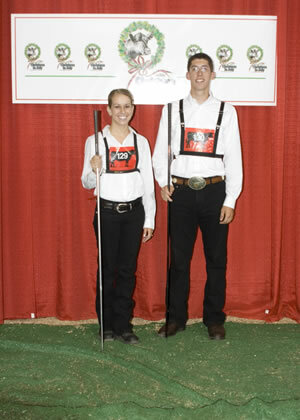 Lindsey White, Staunton, Va., right, won second place showmanship honors at the 2008 National Junior Angus Showmanship Contest, held in conjunction with the National Junior Angus Show, July 17-19 in Des Moines, Iowa. 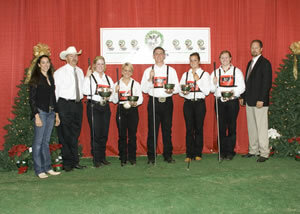 American Angus Auxiliary President-Elect Michelle Rieff presented the silver Revere bowl. The top five winners also received a monetary award from the Ham James Memorial Fund. Photo by American Angus Association. Garrett Knebel, Winamac, Ind., right, won third place showmanship honors at the 2008 National Junior Angus Showmanship Contest, held in conjunction with the National Junior Angus Show, July 17-19 in Des Moines, Iowa. 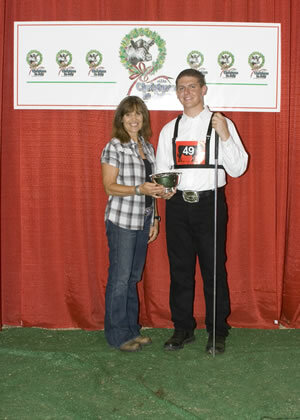 American Angus Auxiliary Secretary-Treasurer Kathi Creamer presented the silver Revere bowl. The top five winners also received a monetary award from the Ham James Memorial Fund. Photo by American Angus Association. 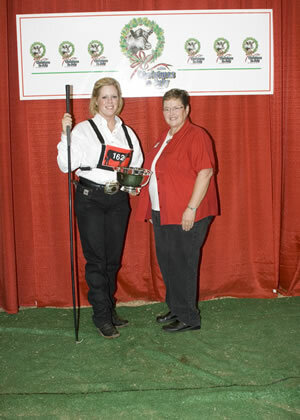 Gretchen Frost, Tallula, Ill., right, won fourth place showmanship honors at the 2008 National Junior Angus Showmanship Contest, held in conjunction with the National Junior Angus Show, July 17-19 in Des Moines, Iowa. American Angus Auxiliary Advisor Mary Greiman presented the silver Revere bowl. The top five winners also received a monetary award from the Ham James Memorial Fund. Photo by American Angus Association. 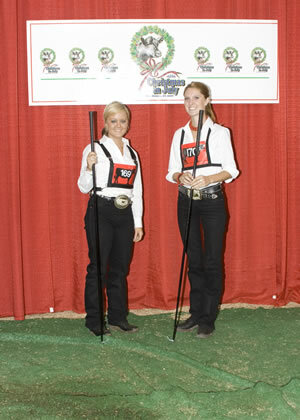 Lauren Moss, Lancaster, Ky., right, won fifth place showmanship honors at the 2008 National Junior Angus Showmanship Contest, held in conjunction with the National Junior Angus Show, July 17-19 in Des Moines, Iowa. 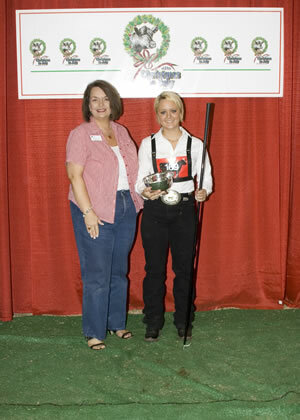 American Angus Auxiliary Past President Sharee Sankey presented the silver Revere bowl. The top five winners also received a monetary award from the Ham James Memorial Fund. Photo by American Angus Association. 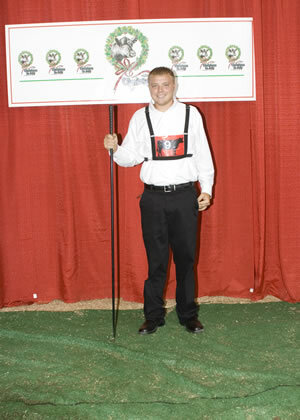 These young exhibitors claimed top five honors at the 2008 National Junior Angus Showmanship Contest, held in conjunction with the National Junior Angus Show, July 17-19 in Des Moines, Iowa. Pictured from left includes Holly Gamble Meier, Clinton, Tenn., judge; Donnie Robertson, Yukon, Okla., judge; Jennifer Smith, Elysian Fields, Texas, first; Lindsey White, Staunton, Va., second; Garrett Knebel, Winamac, Ind., third; Gretchen Frost, Tallula, Ill., fourth; Lauren Moss, Lancaster, Ky., fifth; and Jim Pipkin, Republic, Mo., judge. The top five showmen are named in the final round of the top 15 finalists. Each of the top five finishers received a cash prize from the Ham James Memorial Fund and a silver Revere bowl from the American Angus Auxiliary. Photo by American Angus Association. 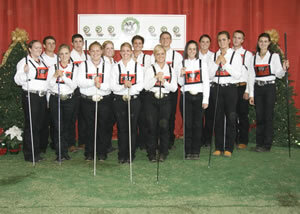 These outstanding showmen won top 15 honors at the 2008 National Junior Angus Showmanship Contest, held in conjunction with the National Junior Angus Show, July 17-19 in Des Moines, Iowa. 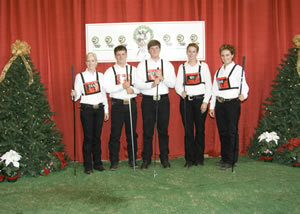 Pictured from left includes Lauren Moss, Lancaster, Ky.; Garrett Blanchard, Firebaugh, Calif.; Kourtney Nelson, Crete, Neb. ; Austin Perry, Prather, Calif.; Marcie Falleur, Gearhart, Ore.; Jennifer Smith, Elysian Fields, Texas; Kyleigh Santee, Langdon, Kan.; Ericka Waggener, Harrodsburg, Ky.; Lindsey White, Staunton, Va.; Garrett Knebel, Winamac, Ind. ; Kylee Carr, Elwood, Ind. ; Staci Anderson, Parkston, S.D. ; Gretchen Frost, Tallula, Ill.; Ben Warfield, Marriottsville, Md. ; and Jessica Willis, Union Bridge, Md. These showmen represented their state in the 42nd annual event, and advanced to the final round, after completing preliminary heats. Each of the finalists received Andis® clippers. Photo by American Angus Association. These exhibitors received honorable mention in the 2008 National Junior Angus Showmanship Contest, held in conjunction with the National Junior Angus Show, July 17-19 in Des Moines, Iowa. Pictured from left includes Sydney Geppert, Mitchell, S.D. ; Ryan Hollenberg, Mexico, Mo. ; Cameron Clark, Rochelle, Ga.; Kelsi Retallick, Glen Haven, Wis.; and Klaire Jorgensen, Exeter, Neb. Photo by American Angus Association. 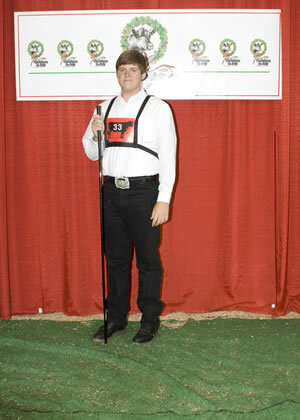 Caleb Ficken, Huntsville, represented Alabama at the 2008 National Junior Angus Showmanship Contest, held in conjunction with the National Junior Angus Show, July 17-19 in Des Moines, Iowa. Forty-six youth from across the country competed for top honors in the 42nd annual event. Photo by American Angus Association. 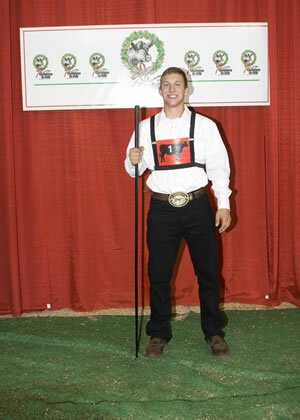 Andy Boecker, Bentonville, represented Arkansas at the 2008 National Junior Angus Showmanship Contest, held in conjunction with the National Junior Angus Show, July 17-19 in Des Moines, Iowa. Forty-six youth from across the country competed for top honors in the 42nd annual event. Photo by American Angus Association. 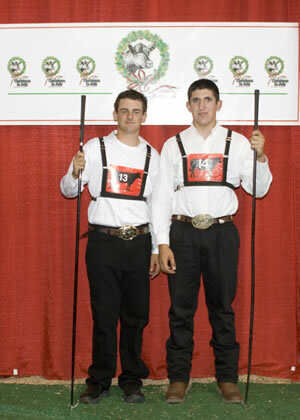 Garrett Blanchard, Firebaugh, left; and Austin Perry, Prather, right, represented California at the 2008 National Junior Angus Showmanship Contest, held in conjunction with the National Junior Angus Show, July 17-19 in Des Moines, Iowa. 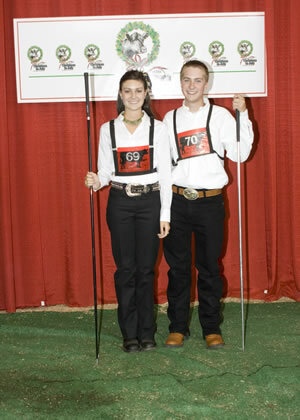 Both showmen advanced to the final round of 15 competitors. Forty-six youth from across the country competed for top honors in the 42nd annual event. Photo by American Angus Association. 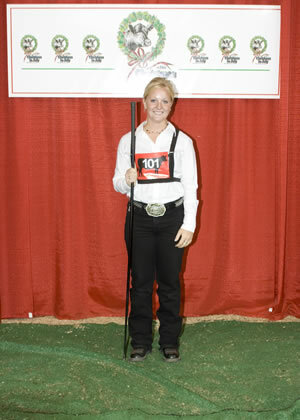 Melissa Miller, Brandon, represented Florida at the 2008 National Junior Angus Showmanship Contest, held in conjunction with the National Junior Angus Show, July 17-19 in Des Moines, Iowa. Forty-six youth from across the country competed for top honors in the 42nd annual event. Photo by American Angus Association. Cameron Clark, Rochelle, represented Georgia at the 2008 National Junior Angus Showmanship Contest, held in conjunction with the National Junior Angus Show, July 17-19 in Des Moines, Iowa. Forty-six youth from across the country competed for top honors in the 42nd annual event. Photo by American Angus Association. 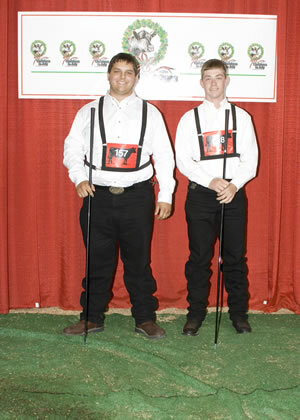 Jordan Paulsrud, Danbury, left; and Wesley Ruby, Greene, right, represented Iowa at the 2008 National Junior Angus Showmanship Contest, held in conjunction with the National Junior Angus Show, July 17-19 in Des Moines, Iowa. Forty-six youth from across the country competed for top honors in the 42nd annual event. Photo by American Angus Association. 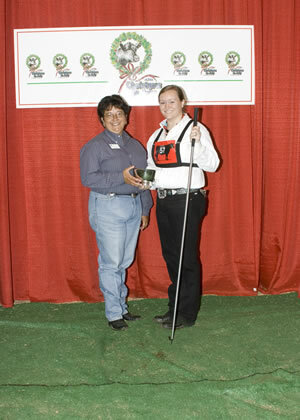 Gretchen Frost, Tallula, left; and Andy Headley, Alma, right, represented Illinois at the 2008 National Junior Angus Showmanship Contest, held in conjunction with the National Junior Angus Show, July 17-19 in Des Moines, Iowa. Forty-six youth from across the country competed for top honors in the 42nd annual event. Photo by American Angus Association. 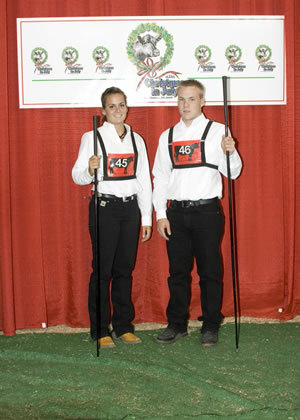 Garrett Knebel, Winamac, left; and Kylee Carr, Elwood, right, represented Indiana at the 2008 National Junior Angus Showmanship Contest, held in conjunction with the National Junior Angus Show, July 17-19 in Des Moines, Iowa. Both showmen advanced as top 15 finalists. Forty-six youth from across the country competed for top honors in the 42nd annual event. Photo by American Angus Association. 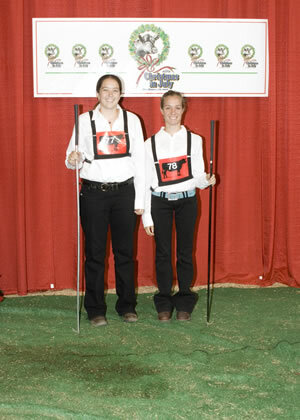 Tess Ludwick, Lawrence, left; and Kyleigh Santee, Langdon, right, represented Kansas at the 2008 National Junior Angus Showmanship Contest, held in conjunction with the National Junior Angus Show, July 17-19 in Des Moines, Iowa. Forty-six youth from across the country competed for top honors in the 42nd annual event. Photo by American Angus Association. 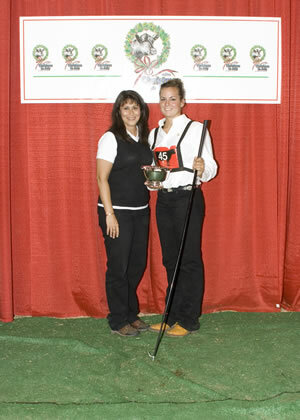 Lauren Moss, Lancaster, left; and Ericka Waggener, Harrodsburg, right, represented Kentucky at the 2008 National Junior Angus Showmanship Contest, held in conjunction with the National Junior Angus Show, July 17-19 in Des Moines, Iowa. Both showmen advanced as top 15 finalists. Forty-six youth from across the country competed for top honors in the 42nd annual event. Photo by American Angus Association. 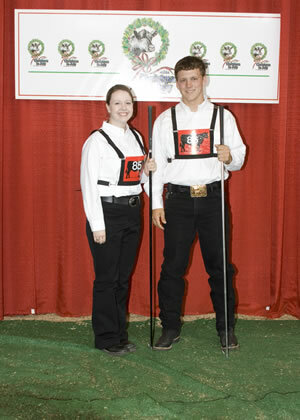 Jessica Willis, Union Bridge, left; and Ben Warfield, Marriottsville, right, represented Maryland at the 2008 National Junior Angus Showmanship Contest, held in conjunction with the National Junior Angus Show, July 17-19 in Des Moines, Iowa. Both showmen advanced as top 15 finalists. Forty-six youth from across the country competed for top honors in the 42nd annual event. Photo by American Angus Association. 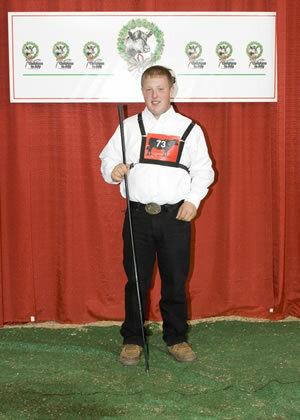 Mitchell White, Shapleigh, represented Maine at the 2008 National Junior Angus Showmanship Contest, held in conjunction with the National Junior Angus Show, July 17-19 in Des Moines, Iowa. Forty-six youth from across the country competed for top honors in the 42nd annual event. Photo by American Angus Association. Rachael Vaassen, Ann Arbor, left; and Tabitha Grochowalski, Ada, right, represented Michigan at the 2008 National Junior Angus Showmanship Contest, held in conjunction with the National Junior Angus Show, July 17-19 in Des Moines, Iowa. Forty-six youth from across the country competed for top honors in the 42nd annual event. Photo by American Angus Association. 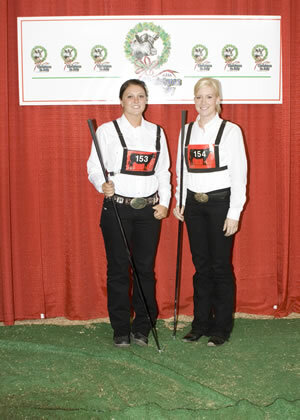 Lindsay Waugh, Goodhue, left; and Kari Stai, New London, right, represented Minnesota at the 2008 National Junior Angus Showmanship Contest, held in conjunction with the National Junior Angus Show, July 17-19 in Des Moines, Iowa. Forty-six youth from across the country competed for top honors in the 42nd annual event. Photo by American Angus Association. 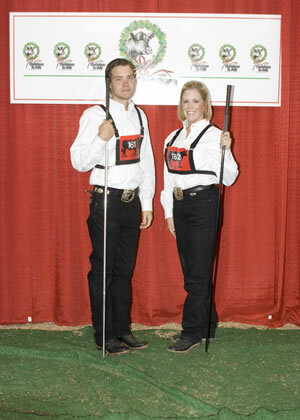 Rachel Bartholomew, Archie, left; and Ryan Hollenberg, Mexico, right, represented Missouri at the 2008 National Junior Angus Showmanship Contest, held in conjunction with the National Junior Angus Show, July 17-19 in Des Moines, Iowa. Forty-six youth from across the country competed for top honors in the 42nd annual event. Photo by American Angus Association. 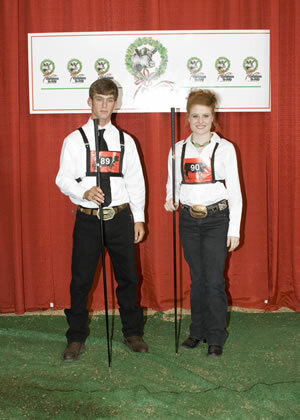 Zachery Brower, Water Valley, left; and Emma Collins, Morton, right, represented Mississippi at the 2008 National Junior Angus Showmanship Contest, held in conjunction with the National Junior Angus Show, July 17-19 in Des Moines, Iowa. Forty-six youth from across the country competed for top honors in the 42nd annual event. Photo by American Angus Association. 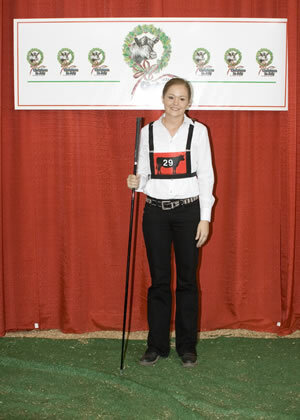 Lynsey Frey, Granville, represented North Dakota at the 2008 National Junior Angus Showmanship Contest, held in conjunction with the National Junior Angus Show, July 17-19 in Des Moines, Iowa. Forty-six youth from across the country competed for top honors in the 42nd annual event. Photo by American Angus Association. 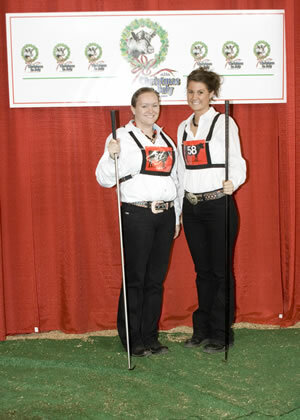 Kourtney Nelson, Crete, left; and Klaire Jorgensen, Exeter, right, represented Nebraska at the 2008 National Junior Angus Showmanship Contest, held in conjunction with the National Junior Angus Show, July 17-19 in Des Moines, Iowa. Forty-six youth from across the country competed for top honors in the 42nd annual event. Photo by American Angus Association. 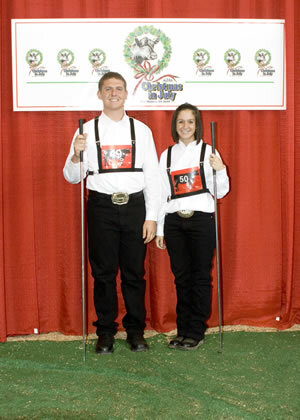 Christina Egner, Shelby, left; and Vince Untied, Granville, right, represented Ohio at the 2008 National Junior Angus Showmanship Contest, held in conjunction with the National Junior Angus Show, July 17-19 in Des Moines, Iowa. Forty-six youth from across the country competed for top honors in the 42nd annual event. Photo by American Angus Association. 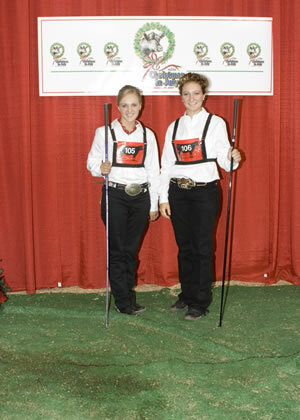 Kelsey Pfeiffer, left, and Rebecca Park, right, both of Orlando, represented Oklahoma at the 2008 National Junior Angus Showmanship Contest, held in conjunction with the National Junior Angus Show, July 17-19 in Des Moines, Iowa. Forty-six youth from across the country competed for top honors in the 42nd annual event. Photo by American Angus Association. 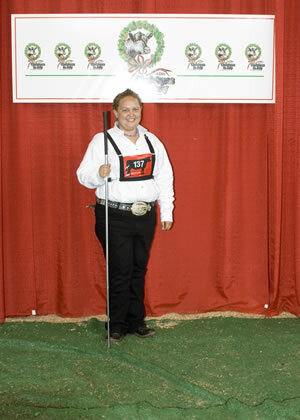 Marcie Falleur, Gearhart, represented Oregon at the 2008 National Junior Angus Showmanship Contest, held in conjunction with the National Junior Angus Show, July 17-19 in Des Moines, Iowa. She advanced as a top 15 finalist. Forty-six youth from across the country competed for top honors in the 42nd annual event. Photo by American Angus Association. 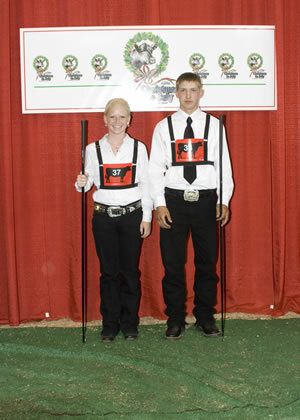 Denton Grim, East Berlin, left; and Cory Thompson, Wellsville, right, represented Pennsylvania at the 2008 National Junior Angus Showmanship Contest, held in conjunction with the National Junior Angus Show, July 17-19 in Des Moines, Iowa. Forty-six youth from across the country competed for top honors in the 42nd annual event. Photo by American Angus Association. 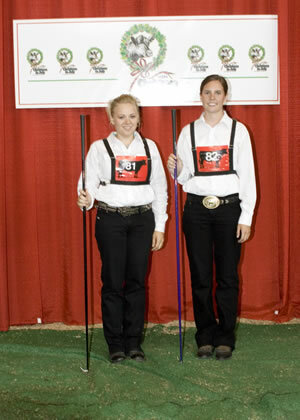 Staci Anderson, Parkston, left; and Sydney Geppert, Mitchell, right, represented South Dakota at the 2008 National Junior Angus Showmanship Contest, held in conjunction with the National Junior Angus Show, July 17-19 in Des Moines, Iowa. Forty-six youth from across the country competed for top honors in the 42nd annual event. Photo by American Angus Association. 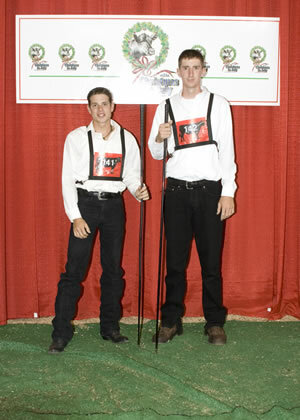 Josh May, Hurricane Mills, left; and Will Mayfield, Pulaski, right, represented Tennessee at the 2008 National Junior Angus Showmanship Contest, held in conjunction with the National Junior Angus Show, July 17-19 in Des Moines, Iowa. Forty-six youth from across the country competed for top honors in the 42nd annual event. Photo by American Angus Association. 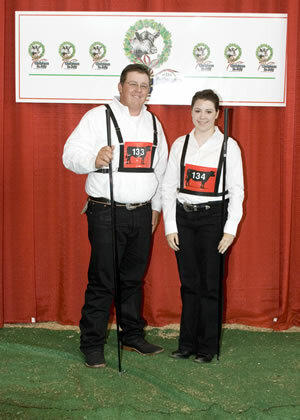 Austin John, Schertz, left; and Jennifer Smith, Elysian Fields, right, represented Texas at the 2008 National Junior Angus Showmanship Contest, held in conjunction with the National Junior Angus Show, July 17-19 in Des Moines, Iowa. Forty-six youth from across the country competed for top honors in the 42nd annual event. Photo by American Angus Association. 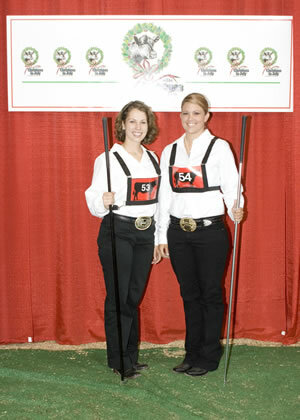 Lindsey White, Staunton, left; and Colleen Buckley, Warrenton, right, represented Virginia at the 2008 National Junior Angus Showmanship Contest, held in conjunction with the National Junior Angus Show, July 17-19 in Des Moines, Iowa. Forty-six youth from across the country competed for top honors in the 42nd annual event. Photo by American Angus Association. 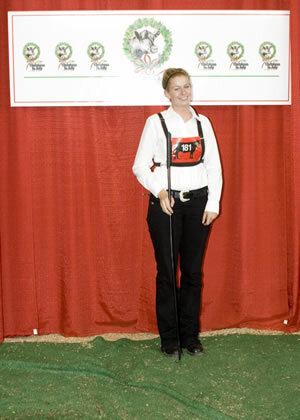 Kelsi Retallick, Glen Haven, represented Wisconsin at the 2008 National Junior Angus Showmanship Contest, held in conjunction with the National Junior Angus Show, July 17-19 in Des Moines, Iowa. Forty-six youth from across the country competed for top honors in the 42nd annual event. Photo by American Angus Association.